Retirement funding assurance for the average investor. I have met many people who told me they didn't believe in the CPF and they didn't believe in CPF Life. When I explained that CPF Life is an annuity that would pay us a monthly income for life from age 65, some would go on to say that they didn't believe in having annuities. There are different reasons given for not having an annuity but amongst investors, those that do not believe in annuities usually believe that they can always do better investing their own money. It could indeed be the case that some of us constantly outperform the market. Well, I am not too confident of my own ability to do so. 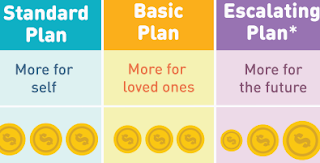 So, I like to have some assurance that I would have a basic retirement income that is predictable. In case my investments do not perform well enough in certain years, I have a well I can depend on. Having a well helps us to live well. Sorry, I couldn't resist it. No Evian? At least have well water. That is what an annuity like CPF Life can do for us. 2. CPF Life Escalating Plan. Agree. An annuity ensures certainty in cash flow in our golden years. Don't think that we can always pick the right dividend stock or REIT. Even dividend stalwarts like SPH, Singpost and SIA Engineering suffer from dividend cut in recent years. Q Will there be a yearly review of my CPF LIFE payouts under all the CPF LIFE plans? Changes in mortality experience. If more people live longer than expected, the monthly payout might be lower, and vice versa. Changes in interest rates. If interest rates are higher than expected, the monthly payout might be higher, and vice versa. Transactions which affect your Retirement Account balance, for example, refund of money arising from selling property, top-ups. As with all CPF LIFE plans, payouts may be adjusted to account for long-term changes in interest rates or life expectancy. Such adjustments (if any) are expected to be small and gradual. We will inform you two to three months before we make any adjustments to your monthly payout. take note. payout wasn't guranteed. Payout is guaranteed but the amount will be within a range. i know payout amount will change/review yearly. 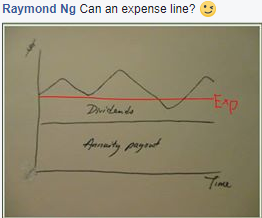 On a serious note, what I did was to illustrate roughly what an annuity is supposed to do for us as investors for income and that is to provide a safety net which greatly reduces volatility. I would argue that given a choice (where CPF Life is compulsory), having an annuity for retirement is a matter of personal preferences. Because annuities does lock up that portion of your retirement fund. I think a lot of sinkies are "complaining" about that. Again, "all other things being equal", etc. Certain things have to be made compulsory because we cannot expect everyone to do what is right and responsible. As long as we are compensated with having the best product there is (i.e. CPF LIFE), I don't have a problem. Assi AK Thank you for being the voice of reason! Dont worry the truth will always prevail. 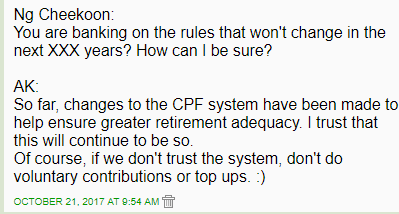 CPF is indeed meant to help us with building our retirement nest egg. 4-5% risk free (SG sovereign risk) interest! One would be insane not to take advantage of that!